Information about the basic Canvas functions, settings, and navigation. These include, the Dashboard, Settings, Notifications, Messages, Global Calendar, Course Homepage and Navigation, Course Analytics, Course Settings, and People. Recently, Canvas added an option to user notification preferences, which is beneficial for students to be aware of. 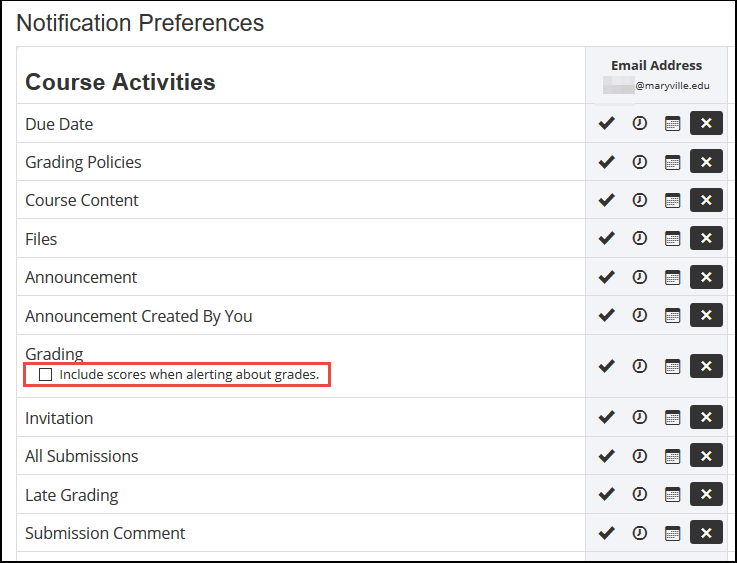 Students can select the Include scores when alerting about grades. checkbox under Grading. If the checkbox is unselected, grades are not included as part of the notification. This option relates to notification for both initial submission grading and changes to existing grades. Please contact the LDT team with questions. Are you interested in having your own sandbox, or development course, in Canvas? A sandbox, or development course, is essentially a testing course. It allows you to try out Canvas features, course ideas, etc. in an environment similar to your typical Canvas course without actually updating a live course and potentially confusing students. You also have access to the same student view feature as you do in a live course, so you can see exactly what a student would see. Build your course and import all the content into your live course(s). This is especially helpful to instructors whose courses may not be available for months, but want to work on building the content. Test out new course ideas. To request a sandbox, or development course, email Learning Design and Technology. If you’re registered for a course, and it’s within two weeks before the term starts, you should have access to the course in Canvas. New courses may not appear on your Canvas dashboard automatically. If this is the case, follow these steps to add a course to your Dashboard. Also included are instructions for removing a course from your Dashboard. As a reminder, non-online Nursing students receive access to a course in Canvas two weeks before a term starts. 2. Click Courses from the left-hand navigation menu. 4. Click the gray star next to the course you want added to your Dashboard. The star turns gold, and appears on your Dashboard. Typically, if you don’t have any courses favorited / starred in Canvas, they all appear on your Dashboard. Once you click the star next to one course, only favorited / starred courses appear on your Dashboard. Favorite / star settings will be reflected on the Canvas iPad app. 4. Click the gold star next to the course you want removed from your Dashboard. The star turns gray, and no longer appears on your Dashboard. Contact us with your Canvas questions! 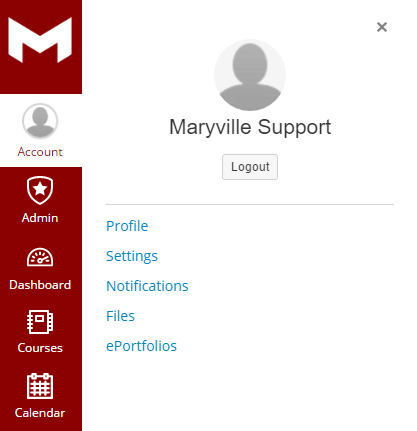 In Canvas, the Account menu features links to your Canvas profile, settings, notifications, files, and ePortfolios. It also features your name and profile photo. The name that appears here is the name that appears to other users. Long names will be truncated with ellipses. In addition, the Logout button is located at the top of the Account menu. The next semester is fast approaching. To prepare for the upcoming semester, we’ve put together frequently asked questions we typically receive before each semester. When is a course made available to faculty in Canvas? The general rule of thumb is that courses are available to faculty 28 days prior to the first day of class. When does content appear for online courses? If you teach online, content will be applied to your courses either the day the course becomes available OR in some cases, shortly after. When do students gain access to their courses in Canvas? Students gain access to courses two weeks prior to the start of the term UNLESS they are in an online graduate nursing course. Students in online graduate nursing courses receive access the morning of the first day of the term. When is a course published to Canvas? Courses remain unpublished until students gain access. Publishing is an automatic process. I’m an instructor, but my course isn’t appearing in Canvas. First, make sure it’s 28 days prior to the first day of class. 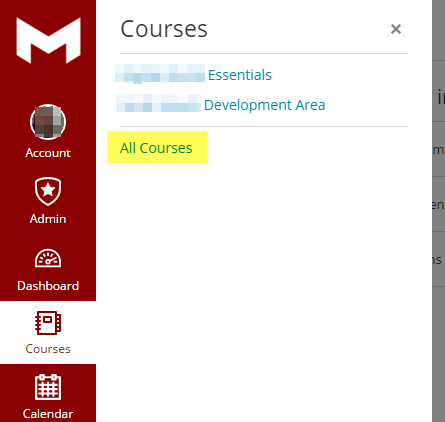 If it is, and your course still isn’t appearing in Canvas, make sure you’re listed as the instructor for that course. You can check that via accessmu.maryville.edu. If you are not listed as the instructor, please contact your college/school. Once listed as the instructor, the course will appear for you in Canvas within 24 hours. This checklist is applicable for non-online courses. Copy content from a previous course into the new blank course (not applicable to online courses). If you’re copying over Turnitin-enabled assignments, you must re-enable Turnitin after the copying process. If you don’t, students won’t be able to submit an assignment through Turnitin. Remember, just updating due dates will enable Turnitin. Post your syllabus in all your courses. Instead of just posting a link to the file, copy and paste the syllabus information… and post a link to the file. Post an initial announcement in all your courses. View recorded Canvas workshops for a refresher on the system. Bookmark community.canvaslms.com/community/answers/guides, as it provides GREAT documentation on using Canvas. Keep a look out for in-person and online (webinar) Canvas workshops hosted by the LDT team. If you have any questions not listed above, please contact LDT. 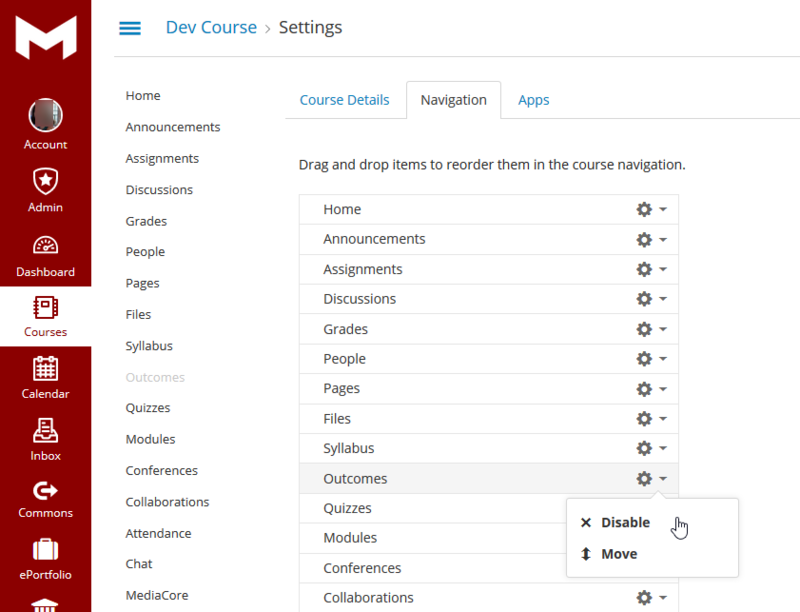 In Canvas, you can reorder the navigation menu as it appears for your students. This can be helpful if you’re using Modules or Quizzes more than other areas of Canvas. You have the ability to move the more frequently-used areas of Canvas toward the top of your students’ menu. You can also disable menu items so they won’t appear in your course menu. Follow these steps to reorder the navigation menu. 2. Click the course card. 3. Click Settings from the left-hand navigation menu. 5. Drag and drop menu items to reorder them. The order that appears in the Navigation tab is the order in which the items appear in your course menu. In addition, click the gear icon to disable an item. Disabled items won’t appear in your course menu. 6. Click Save, when finished. 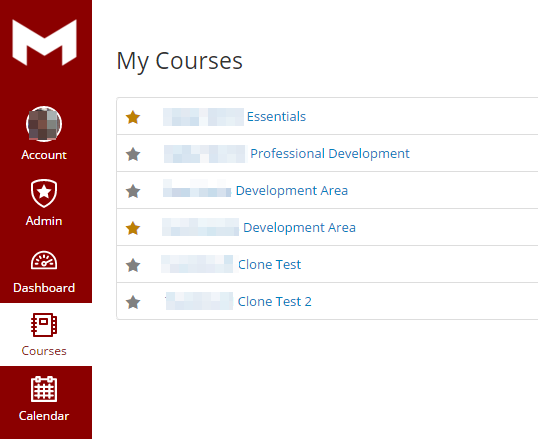 In canvas, course cards on your dashboard represent courses you’re enrolled in either as a faculty member or student. You can change the nickname and color of each card by clicking the gear icon on the card. Once finished customizing your course cards, click Apply. The sidebar also supports course nicknames. Once you create a nickname for a course, it appears with all associated assignments or events. Once you click Apply to save your nickname, refresh the page for the change to take effect. In addition, a new item indicator appears for new announcements, discussions, assignments, files, and graded items. As always, please contact LDT with questions about Canvas. 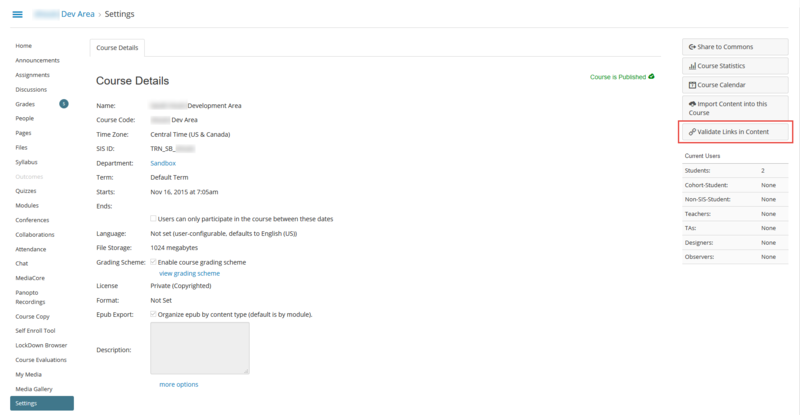 In Canvas, you can verify all published and unpublished links throughout a course to ensure their validity. This feature is available in your course settings. 2. From your dashboard, click your course. 4. Click Validate Links in Content. 5. Click Start Link Validation. The course link validator searches through your course content and returns invalid or unresponsive links. If links are found, Canvas provides the names and links so you can correct the errors. Once you fix any errors, click Restart Link Validation to check your course content again. To help make your Canvas account more personal, we recommend you upload a profile photo to Canvas. We recommend your students also upload profile photos. Your profile photo appears alongside your activity in Canvas and helps further identify you within Canvas. Without a profile photo, a gray silhouette appears in its place. To upload a profile photo, follow these steps. 3. Click the circle where a photo should appear. 4. Select your profile picture. You can Upload a Picture, Take a Picture, or upload an image From Gravatar. As faculty members, you have the ability to customize the items that appear in your students’ course navigation menu. Choose the order that course navigation menu items appear for you and your students by following these steps. 4. Drag and drop items to reorder them in the course navigation. Alternatively, you can click the gear icon, and then Move (follow the on-screen instructions). 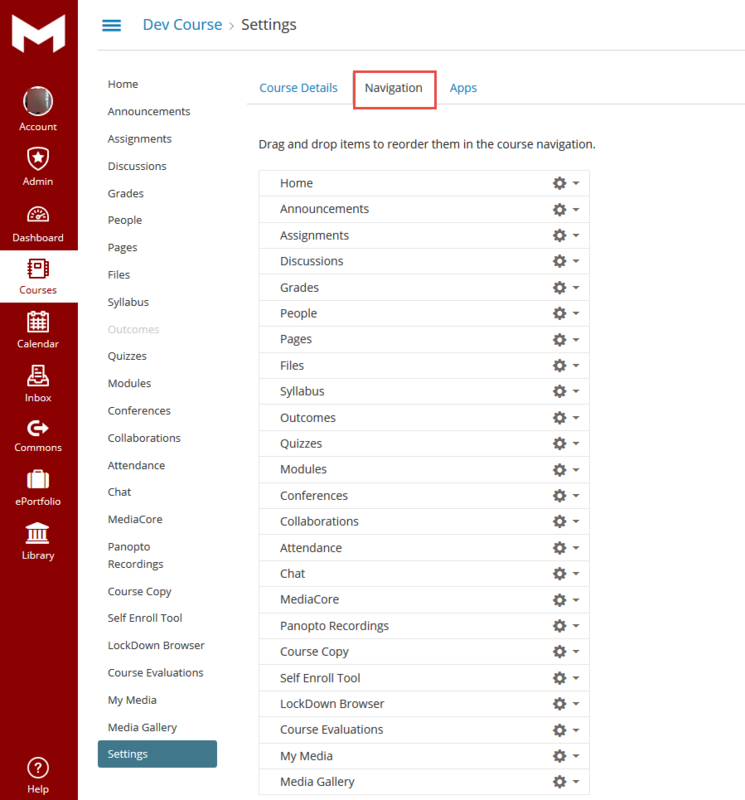 Choose which course navigation menu items appear for your students by disabling them. Disabling menu items will hide them from your students or cause your students to be redirected to a different page. This experience varies on a page-by-page basis. This is helpful if you will not be using certain features in your course. Follow these steps to disable menu items. 4. 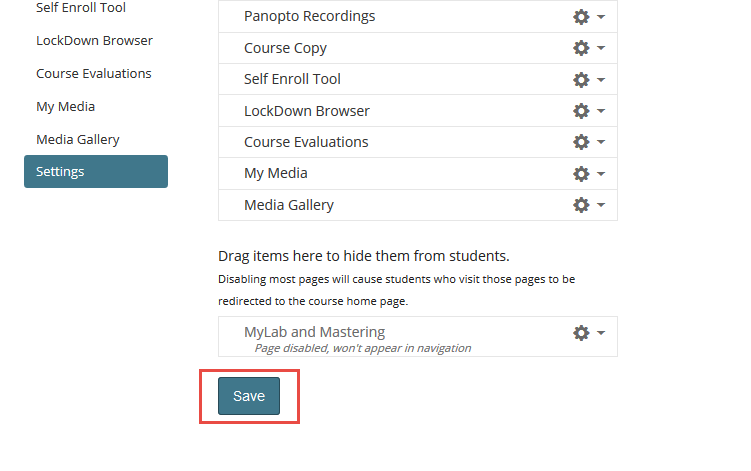 Drag and drop items to the section titled Drag items here to hide them from students.. Alternatively, you can click the gear icon, and then Disable. To re-enable a menu item, click the gear icon next to it, and then Enable.